Campaign 2008: Two Week Notice : Blog Of The Nation Polls, swing states, polls, major money, and more polls. What do the candidates need to do in the next 13 days to win this thing? Polls and politics and presidential candidates, oh my! Yes, another day another poll (more accurately: polls). This time the Wall Street Journal puts Obama ahead by 10 points nationally. Pew has Obama ahead by 14 in a national survey (if you trust any polls). Of course, the national numbers don't mean as much as what's happening in the swing states. The McCain campaign has made Pennsylvania a major focus of the next two weeks, going so far as to say it's a must-win state. Pennsylvania, Ohio, Virginia, Florida, Missouri, Nevada -- all will play a major role in deciding who takes the oath of office in January. For its part, the Obama campaign is rolling out the biggest spending machine in the history of U.S. elections, with major ad blitzes in swing states and a planned half-hour prime time Obama infomercial on the major television networks. If either side has a secret plan to win this thing, now's the time. 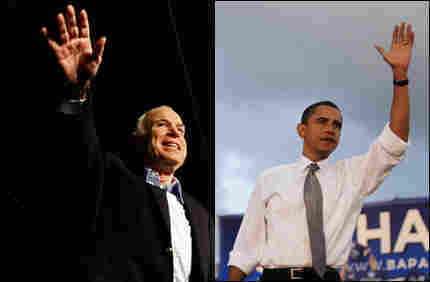 We'll talk with Ken Rudin today, our political junkie, and with two strategists, one on each side, about what John McCain and Barack Obama need to do in the next 13 days to win this election: What's working and what's not.